In the world of theater they say that tragedy is easy but comedy is hard. 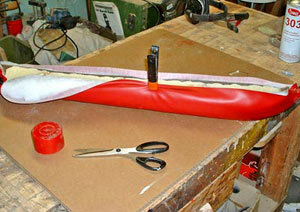 A parallel truth exists in the world of restoration: leather is easy but vinyl is hard. Here's why: leather is very pliable and stretchy in all directions, whereas vinyl generally stretches in one direction and nowhere nearly as much. If you can cover something like, say, an armrest in vinyl then you are certainly going to do a good job covering the same thing or other stuff in leather. So let's cover an armrest! Since we happen to have two armrests to cover in our '55 T-Bird project — and they are long, complex-curved armrests to boot — why not show you how to dress them in the red vinyl interior material? Since we're at it, why not pad them a little too? The originals were padded to a small degree and we're going to show you how to bolster them for a softer, slightly fatter look. Note: Many vinyl-covered parts on cars were not padded. 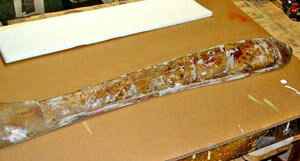 The vinyl was heated and vacuum-shrunk over the raw material using contact cement. Flatter surfaces didn't require vacuum assist, only careful application by hand. This is, in general, easier than covering a padded item, so if you can master this how-to you will have no trouble covering other surfaces. After cleaning the armrest structure's surfaces of dirt and grease and sanding it smooth (if necessary) you are ready to start with the padding material. 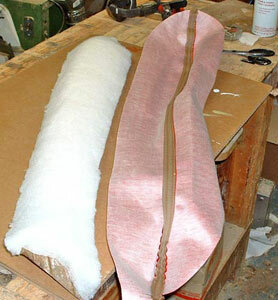 Cut the padding material — in this case high-density foam — to the proper size and test fit it to the piece before doing any gluing. Once satisfied, spray or brush contact cement onto both surfaces and let it tack up before joining the materials. 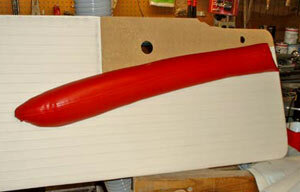 Our T-Bird's armrests are made of fiberglass. We had to fix some cracks with Bondo, hence the pock-marked look of the material. 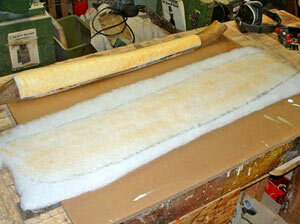 This piece of foam will occupy the depression in the fiberglass. It's all glued in place and rough edges trimmed with a razor blade. The original car's armrests were padded only in the recessed area but we've decided to add bolstering material to the whole thing. This will give the armrest a more padded and soft look. Bolstering material, by the way, used to be loose cotton batting. This is still available, but most upholsterers use nylon batting because it's easier to create a smooth underlayment. Nylon batting is available in any fabric store. 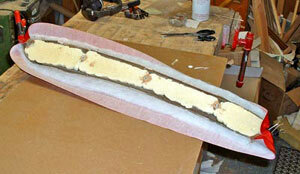 The batting is glued and ready for attachment to the armrest. 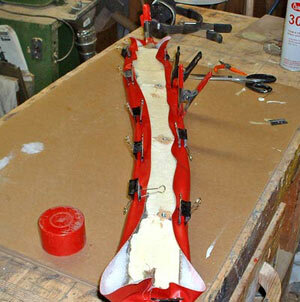 Once the batting is firmly attached to the armrest the excess can be cut away from the edges. There is no reason to fold it over onto the back surface of the armrest, as the vinyl will be glued there. This is now ready to be trimmed. The vinyl, once wrapped around, will form a smooth rounded corner at the edges. Now we're ready for the vinyl material, in this case a pre-sewn piece that was provided with the upholstery kit. You will either be using a bare piece of vinyl or a prepared one (as we did in this exercise). If you're cutting material from a bulk piece leave several inches extra on all edges to be sure you will have enough to stretch around. Now go find some clamps, such as large paper clamps (binder clips) or small spring clamps. The more the better, so don't skimp. Lay out the vinyl and take the time to let it rest and lose any folds or creases. It's best to keep the room temperature above 70 degrees for this purpose, although you can warm it gently with a hair dryer. Next, clip one end of the piece to the end of the armrest and then pull the other end taut. Don't stretch too much, but don't allow any sags either. When you are satisfied that the piece is stretched straight, clamp the other end. The piece is stretched and clamped on the ends. Notice that it is already starting to conform to the shape of the armrest. 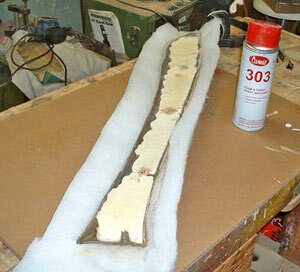 Now move to the center area of the piece and gently pull the vinyl over the edge of the armrest. Clamp it in place after minimizing any pulls or wrinkles. Whether it's at the ends or the sides, always start in the center of a project when stretching fabric. It will work better than any other method. Go to the opposite side of the piece and pull the vinyl tight, and clamp in place. Now you have to work your way around the armrest. From the clamp in the center, split the distance to either end and pull and clamp the material. Do so on the opposite side as you go, and keep it up until you've worked out all wrinkles and puckers. Patience will be rewarded here, and don't be afraid to take sections loose and redo them. Once you've achieved the look you want you need to glue (or staple, in cases where the armrest is wood or is fitted with tack strips) the edges in place. Lift the edges on the top or bottom and brush contact cement on both surfaces, then place popsicle sticks or wax paper between them until the cement tacks up, about 15 minutes. Then, working from the center out, pull gently and press the surfaces together. Once that side is done you can go to the other and repeat the process. If you have to peel back cemented areas due to a sag or wrinkle, heat it with a hair dryer enough to release the cement. 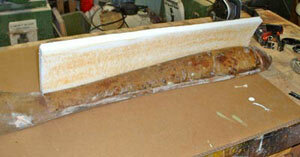 You will have to reapply more cement to glue the pieces back together. Now that's pretty good, and we can iron out any residual wrinkles with a heat gun once everything is fastened to the door.